Internet Protocol (IP) surveillance cameras afford certain conveniences in homes and businesses primarily owing to their accessibility. With these devices, it’s possible for, say, parents to remotely check on their children in their homes or company personnel to see what’s going on in and around their business premises. However, their usability tends to come at the expense of security, resulting in such issues as vulnerabilities and configuration errors. More seriously, this trade-off has also led to some consequences that we’ve observed, with hackers gaining access to cameras to record videos, selling access to cameras to other parties, or even using cameras to snoop around shops and scoop credit card information from unsuspecting customers. The matter of exposed surveillance cameras is, understandably, no concern of most people, for the simple reason that most people don’t own or use surveillance cameras. But this spate of hacker activity involving cameras can actually affect more people than expected. This is because hackers can abuse cameras in a variety of locations frequented by people, from public spaces — such as stores, bars, and restaurants — to more intimate places — such as dressing rooms at swimming pools and in fitness centers, saunas in spa salons, and even operating rooms in hospitals. 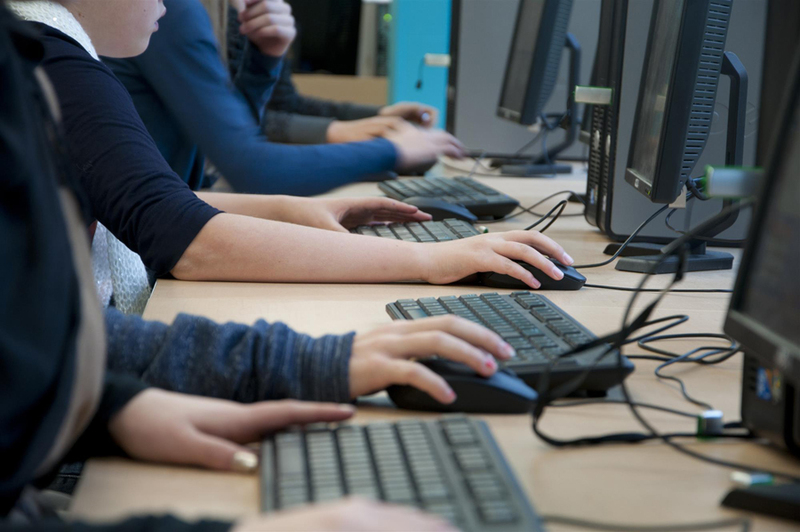 Despite the sensitivity of the images and information caught on exposed cameras, though, we believe that this activity is not the doing of sophisticated hackers. 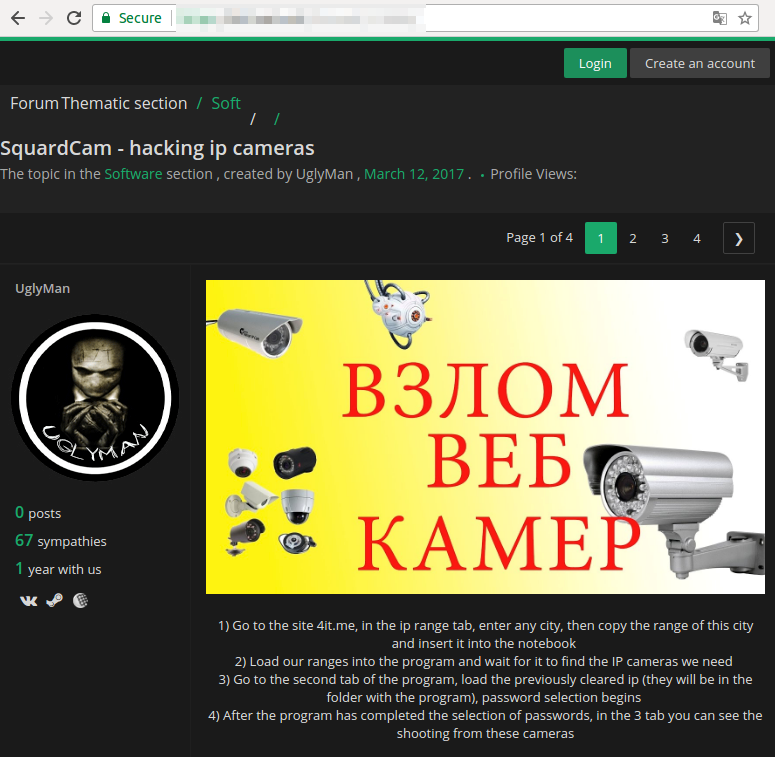 For one thing, services related to the abuse of IP surveillance cameras and other devices connected to the internet of things (IoT) are often advertised not in darknets, or parts of the internet that are available only through specialized anonymity-protecting tools, but in publicly available social networks such as VK.com. The software and tools used for network enumeration and gaining access to cameras are themselves publicly available as well. In addition, the means of payment used for transactions are often not anonymized. We’ve also observed that because cameras often use default passwords or streaming video without authentication, much of the activity related to exposed cameras doesn’t require special knowledge or advanced hacking skills. It’s small wonder, then, that tapping into exposed cameras is considered a low-hanging fruit for entry-level cybercriminals and script kiddies, or unskilled hackers who use existing scripts or code rather than developing their own. It appears that this activity is being done by hackers, whether experienced ones or script kiddies, for the sake of fun. 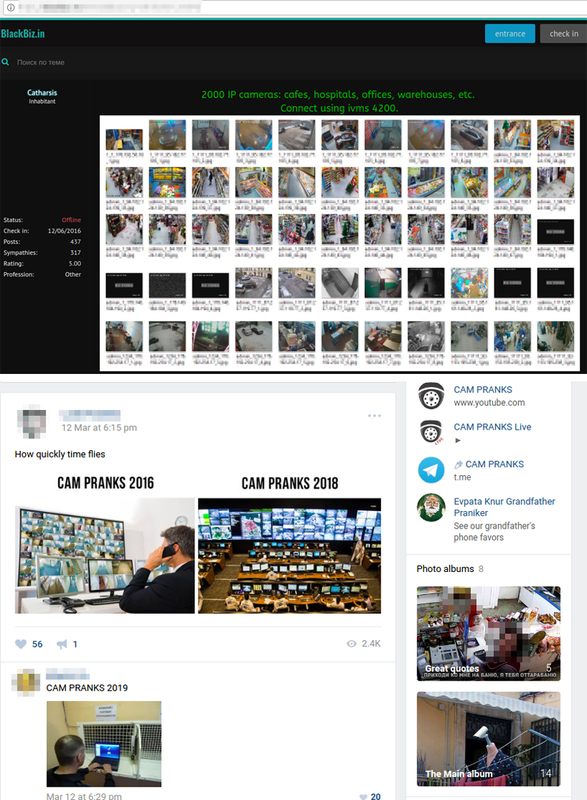 Information on exposed cameras or cameras with known passwords is widely shared on the “Fun” sections of underground forums or in dedicated prank groups in certain social networks. In one post on a forum hxxps://blackbiz[.]in/threads/baza-ip-veb-kamer[. ]20364, as many as 2,000 exposed IP cameras are said to be connected to cafes, hospitals, offices, warehouses, and other locations. On another site, members of a group hxxps://vk[. ]com/camerasdragorock can share and watch videos from exposed cameras and do camera pranks. Hackers usually perform camera pranks by playing different audio recordings or even interacting with people in the videos. Videos of the camera pranks are often shared on dedicated social networking groups, messaging app chatrooms, and YouTube channels, where they rack up hundreds of thousands, even millions, of views. Some pranks are done based on requests in comments on previous videos, with some having catchy titles such as “announcement of a nuclear war in the United States” hxxps://www[.]youtube[.]com/watch?v=Ka-DsDZgAM4. If we look into the script-kiddie-level area of the exposed camera market, specifically the dedicated groups on social networks, a couple of major points become apparent: Cameras that expose personal lives and streaming cameras from paid adult sites are in high demand, and cameras related to physical security are shared for free and used as warm-up or group promotion tools. Amid all the fun and games, however, there are underground actors and script kiddies who actually mean business. Apart from just pulling pranks at the expense of others, there is also a money-making side for these hackers. Effectively, some underground actors are helping script kiddies in automating the process of hacking into and exposing the video streams of cameras or even exploiting these IoT devices for malicious activities such as distributed denial-of-service (DDoS) attacks, covert cryptocurrency mining, and even financial crimes. Most of the stages in the life cycle of exposed devices are automated to be done at scale. At some stages, well-known services or even legitimate pieces of software are used by the actors. They often use their own software, like SquardCam, together with well-known penetration testing tools, like masscan and RouterScan. Sometimes, it isn’t even necessary to use security scanners or other tools to find and access cameras; sites such as Insecam and IP-Scan make the task a lot easier. Brute-force software, with some targeting devices from specific manufacturers, are also used, as are all-in-one solutions like BIG HIT SPAYASICAM 2017, which was made available for US$120 to the first 10 buyers only. For the camera client software, SmartPSS and IVMS-4200 are widely used. There are also step-by-step guides available on underground forums, dedicated groups in social networks, and YouTube channels. Because of the accessibility of these guides, almost anybody who wants to jump on the exposed camera bandwagon can easily do so. 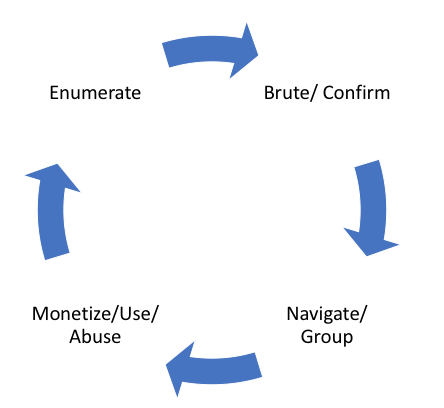 The guides usually describe the first three stages of the life cycle, leaving an opportunity for hackers to exercise some creativity on the last stage. However, other stages are often abused, too. In our research, we found that some of the software distributed as camera hacking software carried malware that could affect the users themselves. This just goes to show that even in the exposed camera market, there is no honor among thieves. There are plenty of “camera shops” and paid groups dedicated to exposed cameras on social networks. One business model involves paid group memberships, which normally cost several U.S. dollars for each member. For example, lifetime membership for Cam Over hxxps://vk[. ]com/cam_over, a VK group for adult-content cameras with more than 500 members, costs around US$3. The prevalent approach, though, is the pay-per-camera (PPC) or pay-per-package (PPP) model. Under this model, prices usually range from US$1.5 to US$5 per item, and could go for less than US$1 for items on sale. Some camera shops and groups allow purchasing of prerecorded videos instead of just selling access to cameras. 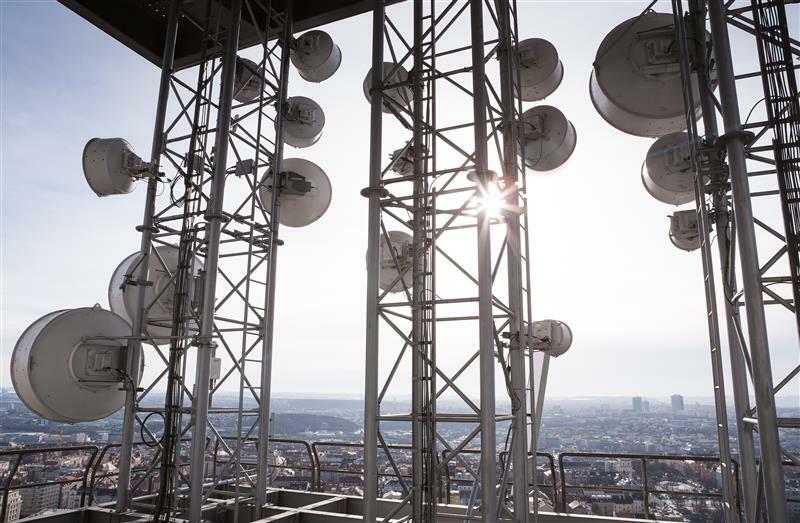 This service opens an opportunity for malicious actors to use exposed cameras to extort or blackmail victims, or to exploit the devices in other crimes and activities such as espionage and data exfiltration operations. Considering that IP cameras are IoT devices, there are several obvious ways they can be abused. Among these is cryptocurrency mining, which is a relatively innocuous way to monetize compromised resources. However, more serious consequences can arise from the use of vulnerable devices as intermediate points for attacks on third-party infrastructures, which may be launched to hide forensic traces, exfiltrate data, or since cameras usually have good internet connectivity, cause denial of service. Underground actors are well aware of the possible impact of exposed cameras on the security of private lives, financial transactions, and even critical infrastructures. In fact, opportunities to cause disruption with exposed cameras are often discussed among them, including efforts to target vulnerable devices and extort ransom from victims. 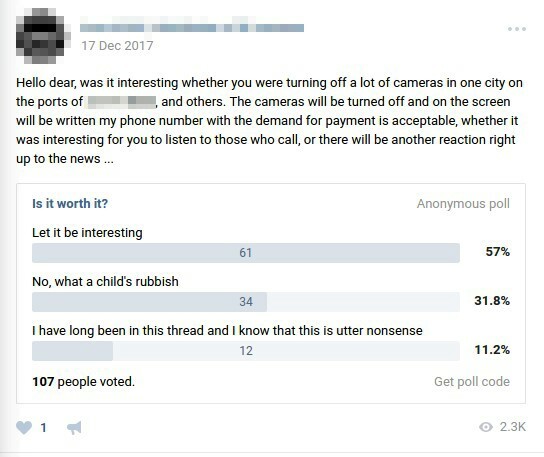 In the example post above, an actor created a poll asking other actors whether it would be worth the trouble to turn off cameras in a particular city and stream a ransom message with a contact number instead of video, with the possibility of recording the victims’ reactions when they make the call. 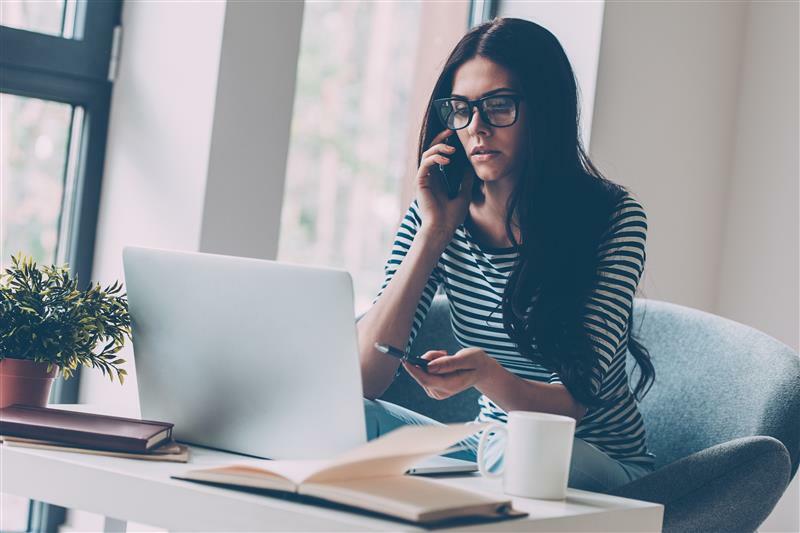 This type of “camera ransomware” can have serious consequences, where victims risk losing access not to previously stored data — as with typical ransomware — but to real-time or future data. 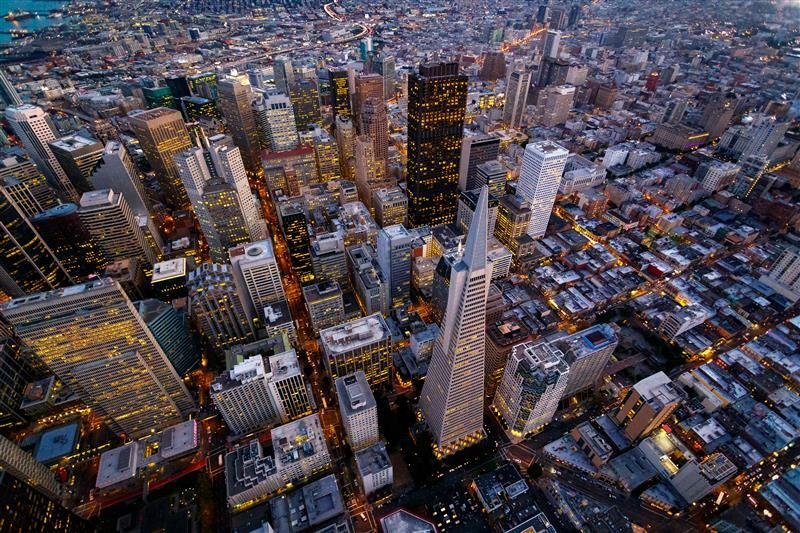 This especially holds true not only in settings such as big factories, where cameras are used to track or control technological processes, but also in environments such as stock exchanges, where visualized real-time data is the core of the business model. Exposed cameras in places such as beauty salons, saunas, and medical institutions open a way to extort celebrities and other public personalities, whereby cybercriminals will threaten to publish their otherwise private videos unless they pay up. 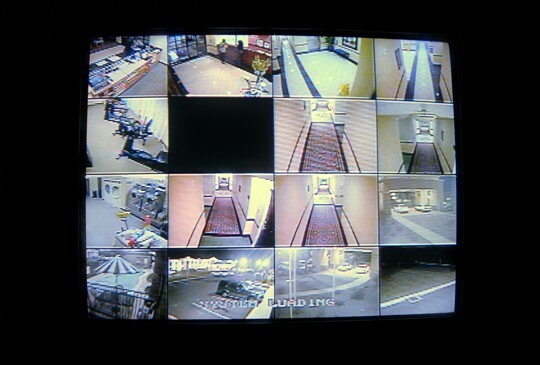 Of course, exposed cameras can affect the physical security of enterprise buildings and critical infrastructures. 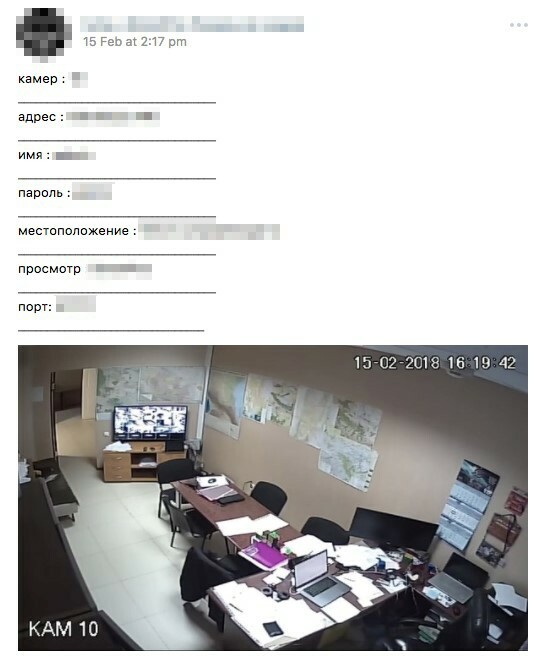 We’ve also found many exposed cameras in meeting rooms, managers’ rooms, security guards’ rooms, crisis management centers, and government buildings. It’s worth noting that in the exposed camera market, actors may choose to pay a certain amount to see someone naked, but they may be willing to pay several times more in order to have access to a board meeting room — considering the higher stakes associated with the sensitive information that can be gathered from such an exposed setting. Our findings serve as a reminder that manufacturers and vendors of cameras as well as the individuals and organizations that use them should carry out best practices whenever applicable so as to adequately secure IP cameras and other IoT devices. 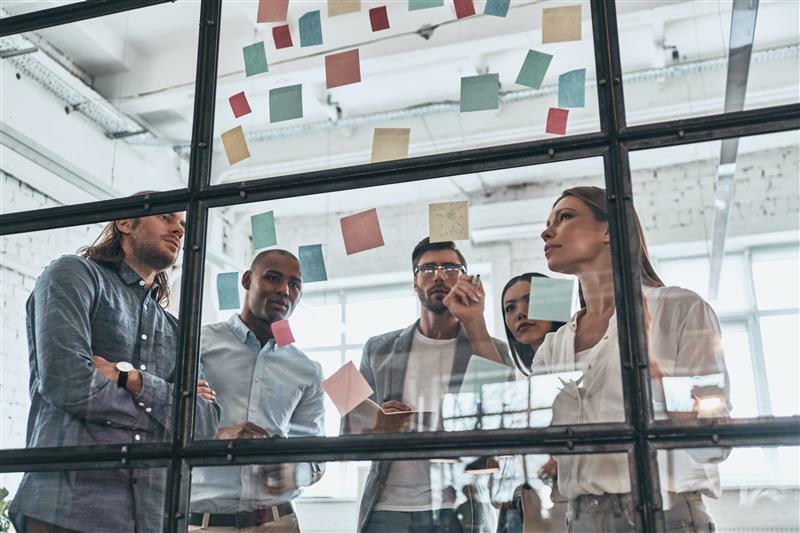 Implementing a “security by design” approach, which requires security features and measures to be built into devices beginning in the earliest stages of the development process. Constantly monitoring the firmware and patching vulnerable system components, using firmware over-the-air (FOTA) updates if necessary. Applying secure boot to ensure that devices boot using only trusted software and to prevent compromised devices from functioning. Minimize the possibility of vulnerabilities being introduced into systems by incorporating the principle of least functionality, whereby any unused or unnecessary ports, protocols, and services are disabled. Enforcing the changing of devices’ default credentials, preferably upon initial setup by users. Changing the default password of any new device with a strong password that has at least 15 characters and a mix of uppercase and lowercase letters, numbers, and special characters. 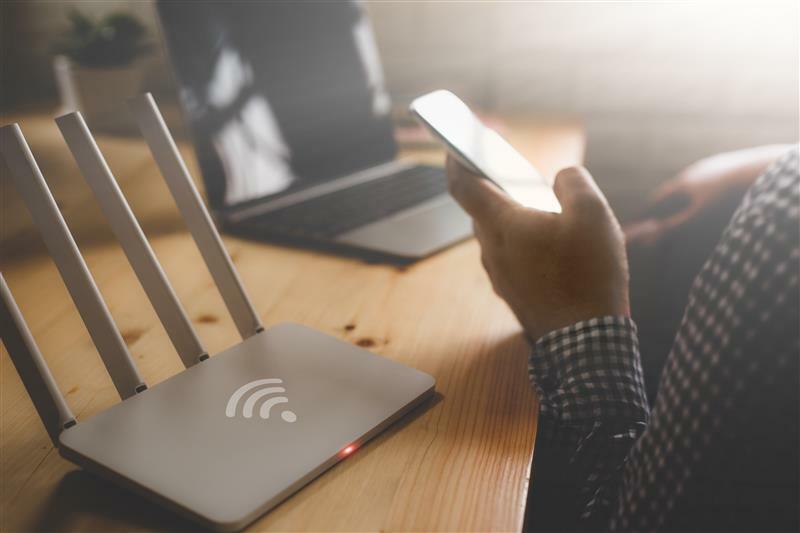 Disabling unnecessary network ports or protocols such as Universal Plug and Play (UPnP), which can allow devices connected to the network to open ports to external networks without warning. Applying new firmware updates and security patches as soon as they’re available to minimize the chance of vulnerability exploits. Because of a thriving underground market and the large number of cameras especially in modern cities, the issue of IP camera or video surveillance system security affects almost everyone individually. Indeed, it is part of a more global problem related to IoT, industrial IoT, and critical infrastructure security.